Happy President's Day! Is today a vacation day for your family? Or is it business as usual? 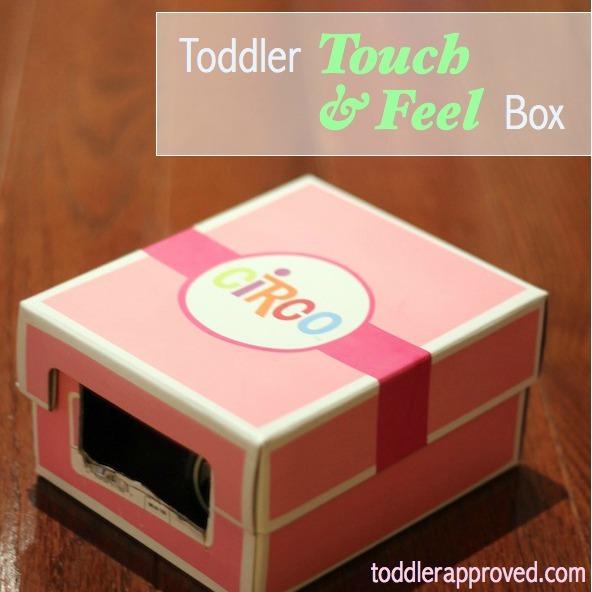 a Touch & Feel box! I used to make simple touch and feel boxes when I was teaching because not only are they fun, they are a great language activity. We tried this last week. My 1-year-old loved finding objects to hide and touching and feeling them. My preschooler loved the challenge of trying to guess what was inside the box each time. Open the box to see if the child is corrent! I contemplated decorating the box and making it look cute... but really, this activity was so exciting that we really didn't need a cute box... Hooray for simplicity! This activity is great for teaching new vocabulary words and practicing describing objects (using a variety of adjectives related to how objects look and feel). If you are a teacher, you can tie this activity into a weekly classroom theme by adding objects that relate to the curriculum/theme. For example, for President's Day I could add a flag or for St. Patrick's Day I could add a little pouch full of gold coins. My preschooler could've played this activity all day and my husband loved trying to find the hardest objects possible to try and sneak into the box. Our 1-year-old loved to stick her hand into the box and feel what was inside and grab it. I would try to describe the object as she touched it so that she began to connect what she was thinking/feeling to actual vocabulary words. As she gets older she'll be able to describe the objects with short one and two word phrases. If you haven't tried this little game yet... add it to your family to-do list this week! I love any activity that we all can do together. Found your blog by looking up President Day ideas, and noticed your recent post here... I just blogged about our recent adventure with textures/ touch by making a "Texture Road." Stop by and check it out if you can! Glad I found your blog, you have a lot of great ideas! Weird. Just realized we have the same name and it's spelled the same! That is rare! Wow! That is so rare. Thanks for stopping by Kristina!! Excited to check out your texture road. Susan, sounds like he did exactly what my daughter did. She loved to grab it and touch it and pull it out. I talked about it while she held it (inside the box or out). Not anything complex for the description. I just picked one word each time. Bumpy, smooth, tickly, soft, rough, etc. ...or the object name... nothing complex. For preschoolers (like my son who I also mentioned above), we did more complex descriptions/ longer phrases/sentences and he did more of the talking. Glad you tried it. Definitely do it again and have lower expectations for the activity. The goal is to touch, feel, and expose your child to new language. It is ok if he doesn't leave the object in the box.